This Friday will see the start of a new feature for Creativity Club members at docrafts.com Every week you can join Emma Collins, myself or some of the special guests from Creativity TV (and possibly all of us at once!) in a special live forum chat only for Club Members! 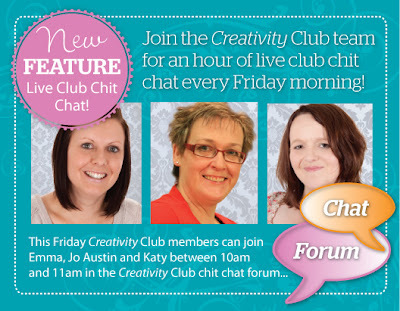 If you are a member just pop onto the special Creativity Club forum at 10am to chat about Creativity TV, projects, downloads and more. Ask us your crafty questions, let us know what you want to see from your club or just join in for a good old chin-wag!